2018 at the Cambridge Manor. 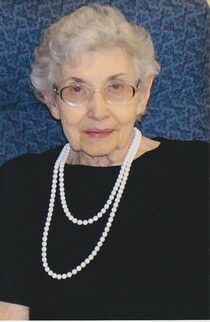 She was born on October 2, 1921 to Jesse E.
to stay in her home. She moved to the Cambridge Manor in July of this year. member of the United Methodist Church and the Women's Fellowship. Jones; great-granddaughter, Jhalia Mayberry; and brother, Marvin Dutcher. great-great grandson; and aunt; Ruth Sughroue of Indianola, NE. the Trinity United Methodist Church in Cambridge, NE with Pastor David Kim. held Tuesday, November 6, from 10:00 AM till 7:00 PM. Mortuary. Lockenour-Jones Mortuary entrust with arrangements.